Janmashtami is actually short for Shri Krishna Janmastami. Janmastami means birth (janma) on the eighth day (astami) after the full moon. What is so special about it? Sri Krishna, described by all scriptures as the original source of all incarnations, appeared as a child from Devaki and Vasudeva, some 5000 years ago. This was in Mathura, India. “As stated in the Bhagavad-gita, the Lord says that His appearance, birth, and activities, are all transcendental, and one who understands them factually becomes immediately eligible to be transferred to the spiritual world. “ – Chapter 3: Birth of Lord Krishna, Krishna Book by His Divine Grace A.C. Bhaktivedanta Swami Prabhupada. Lord Krishna Himself in Bhagavad gita, Chapter 4 text 8 describes the reason of His appearance as follows: paritranaya sadhunam vinasaya ca duskrtam dharma-samsthapanarthaya sambhavami yuge yuge To deliver the pious and annihilate the miscreants, as well as to re-establish the principles of religion, I Myself appear millennium after millennium. Join us in this magnificent celebration, a festival worthy to please God !! Have you already tried dishes prepared by our best vegetarian cooks? Well now is your chance! Free entrance and Free meals which should astound your taste-buds. The heart of the festival. Seeing the deity and swinging the form of Lord Krishna on a swing are sure to give you tangible spiritual boost. How about Some Fun Facts about festival? This Janmastami festival is surcharged with spiritual energy with lots of fun without the help of external aids like alcohol….The festival fun is pure, lasting and healing. The Janmastami Festival is a vibrant festival giving you all you need. Find here under a multitude of the things to do and the various activities, attractions, and entertaining factors that take place during this memorable festival. Before filling in the form, make sure you have arranged for your own accomodations. Thank you for volunteering! Delicious vegetarian meals (prasadam) will be served for free between 12.00-18.00h. Come and enjoy and don’t forget to receive the blessings. Prepare for this spiritual festival by recalling the things in life for which you are grateful; by forgiving your enemies; by tolerating others mistakes; by expressing happiness for whatever God gives you on this day. Most of all, be respectful to devotees and other pilgrims. This is the success formula for lots of blessings on this special day. THE PEOPLE WHO MAKE THE KRISHNA JANMASTAMI FESTIVAL HAPPEN! Would you like to see your logo here as well? Or call our driver and see with him if he can pick you up. Are you also organizing a bus trip to this festival? Contact Malati Devi Dasi and your details will be placed for free on this page. 2. Read the wonderful Bhagavad gita, especially on His appearance day to acquire special blessings. 3. Register as Festival Assistant for setting up tents, cutting vegetables, cleaning, etc. May the Lord bless these devotees with love, devotion and success! 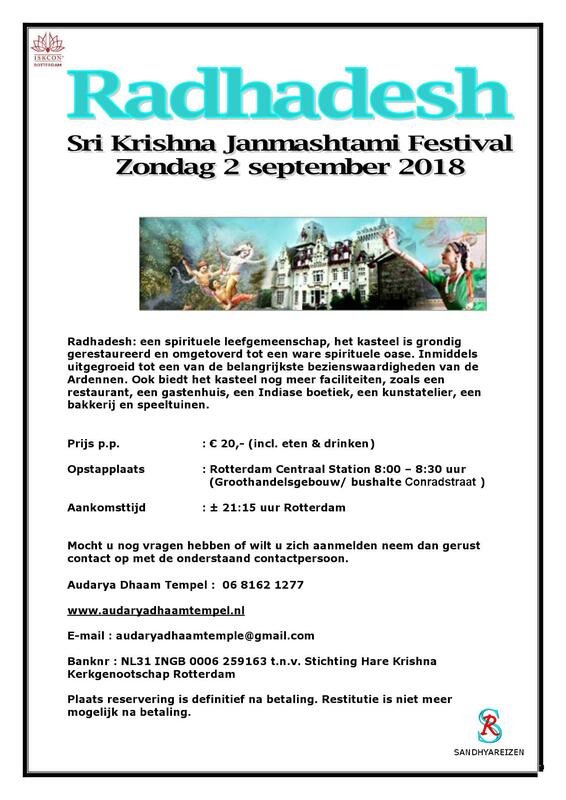 Radhadesh a.s.b.l.– Château de Petite Somme Petite Somme 5 6940 Septon – Durbuy Belgium +32 (0)86 32 29 26 www.radhadesh.com – TVA: BE0421539432 – KvK. 0421539432. Lees onze verkoopvoorwaarden. We will make sure to answer as quickly as possible.